Local notes on what’s happening with musicians, events and more. Have something to share? 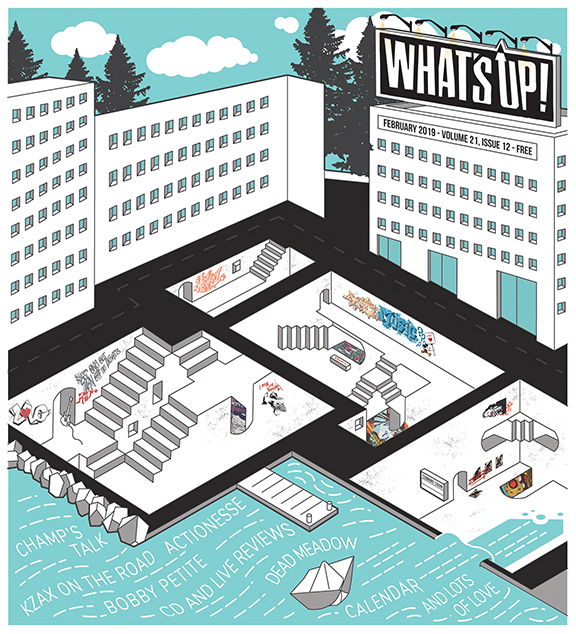 Send your info to editor@whatsup-magazine.com. Hello there my dear friends, how are you all doing these days? I hope you’ve been plugging through the winter OK. I took a new tactic this year to help survive the gray… I’ve been paying attention to how many more minutes of daylight we get with each passing day – right now we’re up to three more minutes a day! A week and a half passes and, suddenly, we’ve got another half an hour… not gonna lie, it’s helped quite a bit. To celebrate the magazine turning 21, we’re doing a week-long bar crawl with FREE local music each night (with one day show). SO GET READY TO ROCK! Shows start Monday, March 4 at the Red Rum, continuing to the Honey Moon, The Firefly, Cap’s, The Shakedown, The Wild Buffalo, and ending Sunday (around brunch) at The Cabin. You can check out the full line up and other info on page 2 this month. I’m beyond stoked about this week of shows. I think it does a good job of highlighting the great music around here… all different styles and sounds. And remember, it’s all free, SO YOU HAVE NO EXCUSE MY FRIENDS. Side note, when I write another le beat, it’ll be March and the Mariners will already be playing exhibition games. The dark days will be nearly over and baseball will be on the horizon. They won’t necessarily be good, mind you… but it’s baseball and so I don’t care. It kind of flew under the radar, but Bodhi released a record a few months ago. If you’re into math rock at all (and, come on, you are just a little bit), then it’s a damn good record to check out. They made their songs pretty much perfect after years of woodshedding. Sadly, the band is no more now, but you’ll always have their music to warm your little math heart. The Spider Ferns are headed down to SxSW to play some shows and be awesome. Before they head out, they’ll be releasing a new single off of their upcoming album, Blossom, which will be released “later this year.” Everyone is later this year… hopefully sooner rather than later. Glitchlette are nearly done with their debut full length, which will be released in the spring. In the mean time, she’s also collaborating with Elite Gynamstics on a new song to be released this month. Watch for it. Tim McHugh (wow, that’s a blast from the past) is releasing a new album on March 2 at the Fairhaven Firehouse. Good stuff. For more information on the show, check out his Facebook event. Hello, I’m Sorry, will be hitting the studio in March – no word on when music will be released, but hopefully it’s soon. Maybe by the end of March because I wann to hear more of their music. Meece spent some time in the studio at the end of December. The band was trying to get in some recording before Lance Vangraham’s wife, Jen, gave birth to Wren Elenore Graham on Jan. 26. CONGRATS! Baby, Mommy, and Daddy are all doing great and bonkers happy. Hooves and Beak spent three days in January at Unknown in Anacortes with Erik Wallace, recording for a release which will be out later in the year. Hopefully this will be out before June because I’d love to review the album before I retire this summer! Bird and Shooter are finishing up their debut album, and it should be out shortly (from what I understand). Chandler Trey Johnson is the drummer, and I was especially stoked to find that out. Looking forward to this. Chris from Kickin’ Names has set up the Cedar Stage at the Woolley Market in Sedro Woolley, with music happening three times a week. If you’re in the area, it’s well worth checking out. Frank N Stein has opened up in the old New York Pizza space on State Street. They will have live music and comedy there I expect fairly soon, but we haven’t gotten the official word of when (ooooh, the mystery!). Hopefully this is happening sooner rather than later. Jeremy from Polecat is no longer Bellingham’s own, having moved south to Portland. Sure, I’m bitter, angry and confused… I might cry myself to sleep most nights… but, seriously, best of luck down south Jeremy. Enjoy. The North Cascades Bluegrass Festival will no longer be held at Hovander, moving to the Deming Logging Show Grounds, a location they’re especially stoked about. The festival runs Aug. 29 to Sept. 3, stay tuned for more details or check them out on Facebook. Your favorite rock ’n’ roll cover band, Flannel, has called it a day. Not sure why, but they have and that’s that. Lovitt closed down, which is a shame. It was a nice place to check out some jazz or other more contemporary forms of music. The town needs places like this – variety from all ages venues to places for mellow jazz and everything in between. Hope something pops up soon – WJMAC is great, but we need more more more! Mostafa is working on a month-long tour which will take him south through California, then east through Texas, back up through Colorado, Utah, Idaho, then home. Excellent! As I try and say as often as possible, this is how you do it, you tour. Wanna be a better musician, you tour. Wanna have a bigger fan base, you tour. Wanna have way too much fun with way too little sleep, you tour. Gas is pretty cheap these days, so get out there. In the last issue, I misidentified the person who recorded Stereo Donkey. Bill Simpkins is the man. Sorry, Bill! There’s more happening, but I’m running out of space, so we’ll call it a day. Thanks for reading this month and throughout the years. Four issues left!